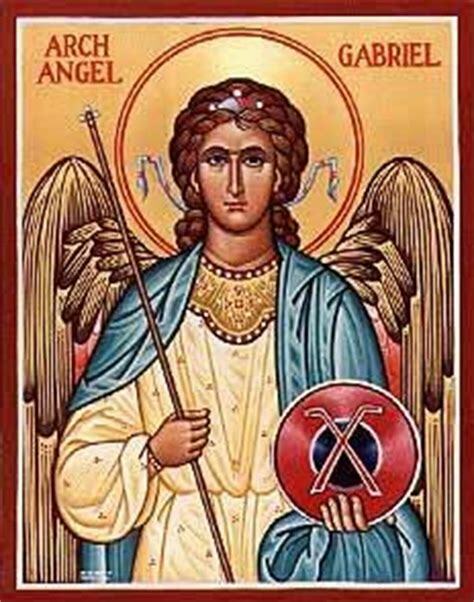 I have had a personal interest in the Archangel Gabriel after learning some years ago that this angel may have had a personal interest in me. I was informed by one of the many entities communicating with the family through my wife, Doris, that Gabriel is my Guardian Angel. It was a hard time believing such a story, of course. And yet circumstances surrounding my life over the years have been so strange at times, and so amazingly magical, that I must wonder just how close this angelic connection has been in my personal life. I have been aware at times that an angelic power has been nearby. Once as a child when running wildly down a construction ditch I distinctly heard a voice tell me to “watch out” and I stopped in my tracks. Just then a heavy iron pipe dropped into the ditch in front of me. Had I taken another step I would have been killed. On another occasion, while waiting on a side street for traffic to clear and becoming impatient in my desire to bring my car out into the main street, I saw what I perceived as a break and was about to step on the accelerator. Just then I heard a distinct voice say “Wait!” I held back as a speeding truck appeared from behind a parked car. One Sunday morning while I was serving as a Sunday School Superintendent at a Baptist Church, the area was beset by a blinding snow storm. One little boy who lived several miles out of town had been brought to church by his parents. After everybody left this little fellow was still waiting for his ride home. It became my responsibility to try to drive him home in that storm. As I turned down the country road toward his home I knew why his parents did not pick him up. The road was drifted shut. After plowing into the drifts for about a mile my car became mired and I could go no more. I could not go ahead. I could not turn around. The little boy lived at least another mile farther ahead. Neither of us were dressed for such a storm. All I could do at that point was to pray for help. Just then I heard a roar and a young man pulled up beside us on a snowmobile. He was wearing a ski mask over his face so I could not see who he was or what he looked like. He had a shovel on the machine. He jumped off, dug the snow away from my car, got me turned around so I could drive back out of the snow in my own tracks. Then he volunteered to take the boy safely on to his home. I like to believe my personal guardian angel was riding that snowmobile that morning. So what do we know about Gabriel? The Roman Catholic Church lists Gabriel among the seven important archangels. His name depicts the Strength of God. Gabriel appears frequently in the Holy Scriptures. In the Book of Daniel he is the angel that explains Daniel’s visions. In the Gospel of Luke, Gabriel is the angel that foretells the births of both John the Baptist and of Jesus. Daniel may have met Gabriel in human form. In Chapters 10:5-12:13 Daniel encounters a being with the appearance of a man and dressed in linen that speaks with Daniel about future events. Many Bible scholars believe this being was Gabriel. In Rabbinic traditions, Gabriel is one of four high angels standing at the Throne of Glory. Gabriel stands at the left hand of God. He is said to be the angel of revelation and the Prince of Fire. He and the Archangel Michael were witnesses at the wedding of Adam and Eve, and it was Gabriel that destroyed Sodom in a rain of fire. Indeed, his color is red. Gabriel is said to be a manifestation of God’s judgment. He is listed among the six angels of death. His specific role is as messenger of death for kings. There also is the legend that it will be Gabriel that blows the trumpet to initiate the end of time, the Last Judgment and the end of the world as we know it and the rebirth of the new Earth. Getting back to looking at Gabriel in a more personal light, there is a story that this archangel also is the patron saint of messengers. This includes those who work in communicating information such as newspaper, radio, television and remote sensing. Oh yes, and Gabriel also has time to function as a guardian angel for individuals. Can it be that this lowly writer and retired newspaper reporter could have been so honored?